Ben Yole cranked up his bid to smash his own state training record of 124 wins by successfully preparing 50% of the 6-race card in Devonport on Sunday night, taking his 2018/2019 tally to 111. The Sidmouth trainer snared three winners, Black Ops (pictured - No 6) backed up from its outstanding victory in Launceston on Friday night, Ready To Fire and Blacklist, on debut in the state. "Black Ops has a new lease of life, we have just bought another property with areas of bush on it and we've been working him up through there, he has already won three races in April and we are only half way through the month," said Ben. 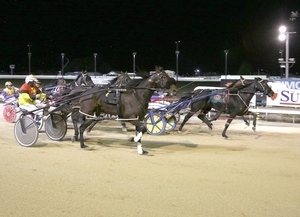 "His win on Friday night was tremendous, he found the front with good gate speed and Troy (McDonald) rated him well from there, the tempo lifted in the third quarter running 29.3 seconds and he was pulling hard but when Troy went for him at the top of the home stretch he still had enough in the tank to hold them off." Black Ops drew poorly outside the front line in Devonport in the John McKenna Race Night Vet Pace over 2297 metres. "Troy had no option but to ease back at the start and he was able to find cover just worse than midfield before hooking three-wide going down the back a lap and a half out, Troy has a good feel for him and they sat three wide to the 400 before finding the death and hitting the front turning for home, he doesn't respond to the persuader so Troy just had to urge him to the line and he got home by half-neck," Yole said. "Ready to Fire scored a soft win for Samantha Gangell, she found the one-out one-back position and cruised up to them in the home straight and Blacklist showed early speed to lead and raced home to score impressively by six metres." Kent Rattray and John Walters continued their winning run with Karalta Moondance winning the first after coming in for solid support, Yodellin Cowgirl held off the fast-finishing Mostly Spirit to win by a head for Kristy Butler and Gareth Rattray with Flashy Ruler cruising home in the last for John Castles and Rohan Hillier.